Kateryna holds a degree with distinction in Computer Engineering (2008) and a PhD (Cand. of Sci., 2013) in Technical Sciences/Information Technology. She joined the Centre for Software Reliability (CSR) at City University London right after completing her PhD to work on a security and safety research project SESAMO (Artemis JU project, 2012-2015). Starting from 2014, she also takes part in the CEDRICS project that addresses research questions on cyber security risks in industrial control systems. Prior to joining CSR, Kate worked as a lecturer in the Department of Computer Engineering, Taurida National V.I. Vernadsky University, Ukraine (2008-2012) and conducted academic research in the field of software dependability under the supervision of Prof. V. Kharchenko. 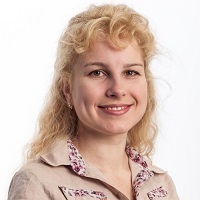 In parallel with her teaching and research work, Kateryna held a full-time Team Lead position at a software development company Extensoft, providing management, support and quality assurance for the Artisteer tool (2008-2012), preceded by a technical support position for the CodeCharge Studio product at YesSoftware company (2006-2008). After joining CSR, her further industrial experience includes a part-time consultancy and industrial research experience at Adelard LLP (London, UK). Andrashov, A.A. and Netkachova, K.I. (2012). Safety Case-oriented system requirements analysis: training. National Aerospace University "Kharkiv Aviation Institute" (KhAI). ISBN 978-966-662-270-2. Kharchenko, V.S., Netkachova, K.I., Orekhova, A.O., Tarasyuk, O.M., Gorbenko, A.V., Sklyar, V.V. … Illiashenko, O.O. (2012). CASE-Assessment of critical software systems. National Aerospace University "Kharkiv Aviation Institute" (KhAI). Andrashov, A.A., Gordeyev, A.A., Lobachova, K.I. and Kharchenko, V.S. Software Quality Assessment and Expertise. ISBN 978-966-662-188-0. Bloomfield, R., Butler, E., Guerra, S., Bloomfield, R.E. and Netkachova, K. (2017). Security-informed safety: Integrating security within the safety demonstration of a smart device. Bloomfield, R., Butler, E. and Netkachova, K. (2017). Assurance of open systems dependability: developing a framework for automotive security and safety. 6th Workshop on Open Systems Dependability Tokyo, Japan. Alemzadeh, H., Barbosa, R., Brancati, F., Gallina, B., Lawford, M., Natella, R. … Silva, N. (2017). Message from the WoSoCer workshop organizers. Netkachova, K., Müller, K., Paulitsch, M. and Bloomfield, R. (2015). Security-Informed Safety Case Approach to Analysing MILS Systems. European Network of Excellence on High Performance and Embedded Architecture and Compilation (HiPEAC), International Workshop on MILS: Architecture and Assurance for Secure Systems 19-21 January, Amsterdam, The Netherlands. Netkachova, K., Müller, K., Paulitsch, M. and Bloomfield, R. (2015). Investigation into a layered approach to architecting security-informed safety cases. Netkachova, K., Müller, K., Paulitsch, M. and Bloomfield, R. (2015). A layered approach to architecting security-informed safety cases (applied to an avionics case study). Bloomfield, R. and Netkachova, K. (2014). Building blocks for assurance cases. Bloomfield, R.E., Netkachova, K. and Stroud, R. (2013). Security-Informed Safety: If it's not secure, it's not safe. 5th International Workshop on Software Engineering for Resilient Systems (SERENE 2013) 3-4 October, Kiev, Ukraine. Netkachova, K. (2011). The Concept, Design and Implementation of Safety Case Cores. Critical Infrastructure Safety and Security 11-13 May, Kirovograd, Ukraine. Lobachova, K. and Kharchenko, V. (2007). A Conceptual Approach to Assessing Composite Component-Based Software System Reliability. Advanced Computer Systems and Networks: Design and Application 20-22 September, Lviv, Ukraine. Lobachova, K. (2007). Analisys of Apache and IIS web servers reliability. InfoTech 10-16 September, Sevastopol, Ukraine. Netkachova, K. and Bloomfield, R. (2017). Is Chocolate Good for You - Or, Is the Cloud Secure? Computer, 50(8), pp. 74–78. doi:10.1109/MC.2017.3001250 . Netkachova, K. and Bloomfield, R.E. (2016). Security-Informed Safety. Computer, 49(6), pp. 98–102. doi:10.1109/MC.2016.158 . Netkachova, K. (2012). Predicting the number of software defects based on testing results. Radioelectronic and Computer Systems, 7(59), pp. 92–95. Netkachova, K. and Kharchenko, V.S. (2012). Analyzing the Dynamics of software vulnerability detection using a logistic curve. Systems of Control, Navigation and Communications, 2(22), pp. 173–177. Netkachova, K. (2012). The model and implementation of Safety Case Cores. Information & Security, 28(2), pp. 286–295. Netkachova, K. (2011). Information Technology for Assessing ICS Functional Safety Using Parameterized Safety Case Tools. Systems of Control, Navigation and Communications, 4(20), pp. 230–232. Netkachova, K. (2011). Safety assurance and trust cases with the use of formal notations. Weapons Systems and Military Equipment, 3(27), pp. 89–97. Netkachova, K. and Pokrova, S.V. (2011). Оценка и обеспечение безопасности систем электронного образования на основе веб-сервисов. Бизнес Информ, 6, pp. 183–186. Netkachova, K. (2010). Safety Case Methodology: Architecting Principles. Radioelectronic and Computer Systems, 7(48), pp. 109–112. Andrashov, A., Kharchenko, V., Netkachova, K., Sklyar, V. and Siora, A. (2010). Safety Case-Oriented Assessment of Critical Software: Several Principles and Elements of Techniques. Monographs of System Dependability, 2, pp. 11–25. Lobachova, K.I. (2009). The Concept and Architecture Of Safety Cases: Elements of Analysis. , 7(41), pp. 261–267. Lobachova, K.I. and Kharchenko, V.S. (2008). A Conceptual Approach to Assessing Composite Component-Based Software System Reliability. The bulletin of Khmelnitsky National University: Technical sciences, 4, pp. 17–20. Lobachova, K.I. (2008). A Multifunctional System for Assessing and Comparing Software Dependability. Radioelectronic and Computer Systems, 6, pp. 219–223. Lobachova, K.I. and Kharchenko, V.S. (2007). Assessing Software Vulnerabilities and Recovery Time Using Open Resources. Radioelectronic and Computer Systems, 8(27), pp. 61–65. "Structured Assurance Cases: A Crash Course"
Peer reviewed papers submitted for publication and presentation at conferences and workshops: WoSoCer 2017, Assure 2017, SAFECOMP 2014, IEEE Transactions on Reliability, DESSERT conferences., Reviewer. A member of the organizing committee for WoSoCer 2017.